My buddy Pete shared a cool quote with me over the weekend. It was written by the head of a well-known microphone manufacture (so we have to assume he’ll have a very pro-microphone agenda), but I’ll let you decide for yourself if you think it’s valid. EQ should only be used in emergency situations. Now, I personally think there’s a LOT of wisdom in that statement, so before you write it off as nonsense and move on to your next (much less-interesting) email, let’s unpack it for a second, shall we? Rather than give you a logical argument, let’s go for an emotional one. Take a second to imagine that you’re working on a BIG project. Maybe it’s your first paid project. Or perhaps a really well-known band in your area has hired you to record their next album. Are you there? Are you feeling the excitement and anxiety all at once? You find yourself EQ-less. What do you do? What do you focus on? The only thing you CAN focus on: the SOURCE. And that includes the holy grail of engineering skills: mic placement. Next time you’re setting up for a session, pretend that you are forbidden to use EQ (even during mixing). Notice how it will change how you record. You’ll be much more vigilant about capturing an awesome recording. 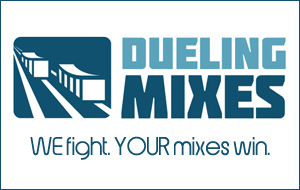 And that’s actually one of the HUGE back-end lessons people are learning inside of Dueling Mixes. They’re hearing what good-sounding tracks sound like BEFORE any EQ has been applied, and they’re learning that sometimes it’s okay to use NO processing at all.